Shumba Camp is situated in the centre of the Busanga Plains close to permanent water and within easy access of the teeming floodplains. s they dry up, the Busanga Plains attracts herds of lechwe, puku, wildebeest – and their predators: lion, cheetah and wild dog. And Shumba Camp stands in the centre of this wildlife paradise, with its view stretching 360 degrees across the plains to the miombo woodland in the hazy distance. Shumba Camp is located in the centre of the Busanga Plains, home to hundreds of red lechwe, ubiquitous puku, stately roan and the diminutive oribi. Lichtenstein’s hartebeest, herds of wildebeest, zebra and buffalo make for a full set of antelope all of which move onto the Plains as the dry season progresses. This wealth of game is a big attraction for predators, including wild dog, cheetah and prides of lion. Shumba is named after a favourite species in the area: prides of lion sometimes up to 20 strong! 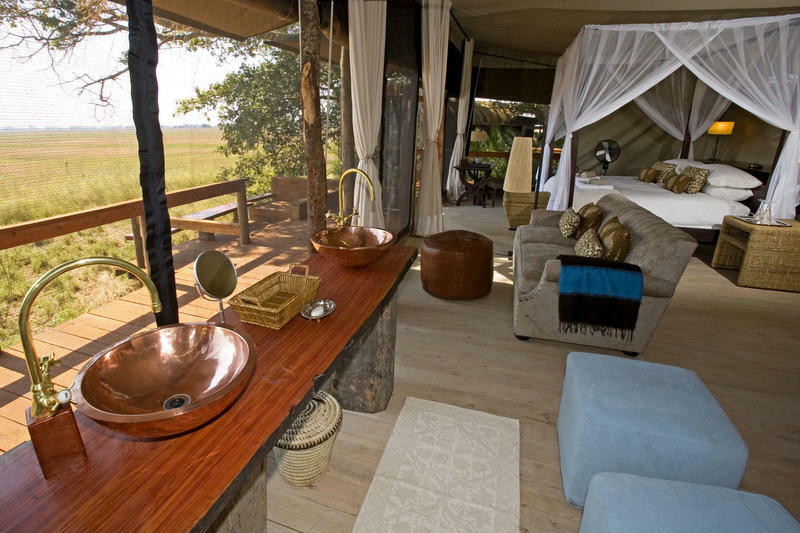 Viewing of game species is possible from the comfort of the tent or main deck, while the camp’s fig trees ensure both shade and constant bird activity. The dining and bar area is elevated so as to take in this vista and each morning’s sunrise; dinner takes place either here or in the cosy boma where guests can also enjoy elements of local Zambian culture. A maximum of 12 guests can be accommodated at any one time and great emphasis has been placed on the “guided” experience – being led by qualified, enthusiastic people with in-depth knowledge of the area and its wildlife. Guests have the option of game drives in and around the Plains and night drives provide the added excitement of the nocturnal wonders of the area. Guests have the option of game drives in and around the Plains and water-based activities when the Plains are still inundated, while night drives provide the added excitement of the nocturnal wonders of the area. 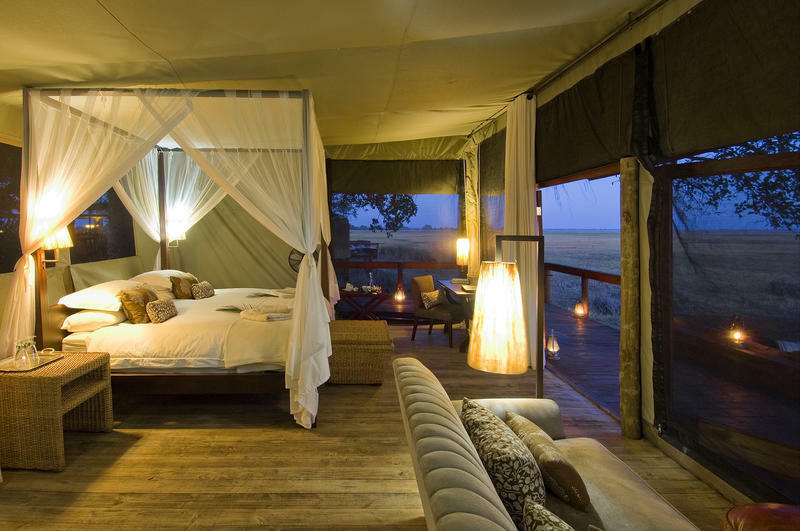 Shumba Camp is perfectly situated to take advantage of the plains game and predator concentrations of the Busanga Plains, being situated as it is within close proximity to permanent water and having easy access to a mix of seasonal and permanent floodplains. Shumba is named after a favourite species in the area – prides of lion sometimes up to 20 strong! Viewing of species like puku, lechwe and hippo is possible for much of the day from the comfort of your tent or the main deck, while the camp’s fig trees ensure both shade and constant bird activity in the canopy above. Guests can enjoy game drives in the Busanga. NOTE: Shumba Camp is closed seasonally between 01 December and 30 April each year. At 22 500 square kilometres, Kafue National Park is one of the largest National Parks in Africa. It is fed by three rivers, the Lufupa in the north-west and the Lunga and Kafue in the north-east. The Lufupa River floods in the summer, creating a large floodplain delta system that attracts thousands of waterbirds. The Lunga and Kafue rivers are wide and slow-flowing, banded by riverine forest. The Park has the largest mammal species diversity in Zambia due to an interesting habitat mix which includes miombo woodland and seasonal open grassy areas called dambos. The Park boasts 55 large mammal species – including 20 ungulate and 6 cat species. In the extreme north of the Kafue lies the Busanga Plains – one of Zambia’s most significant wetland resources and one of the few areas in the world that remain untouched by development and human activity. 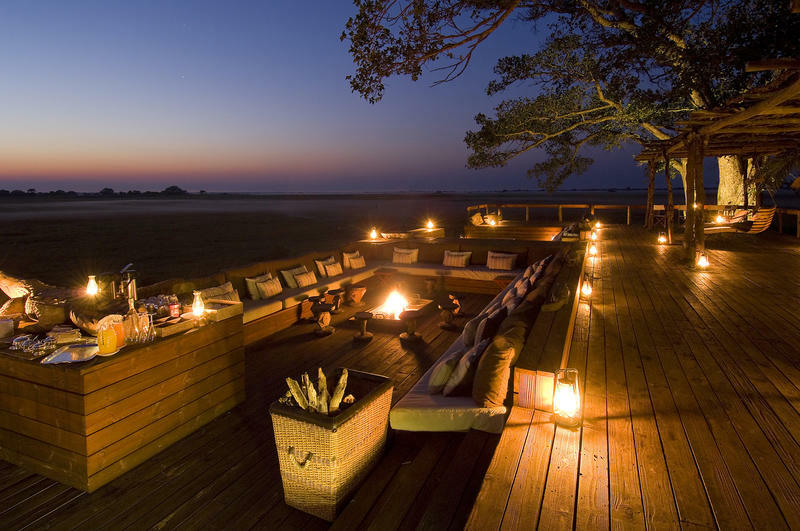 Considered the jewel in the Kafue crown, these plains cover an area of approximately 750 square kilometres and Shumba Camp is in the centre of this breathtaking wilderness. The Plains are home to hundreds of red lechwe, puku, roan and the diminutive oribi. Lichtenstein’s hartebeest, herds of wildebeest, zebra, buffalo and Defassa waterbuck are often seen. This wealth of game on the plains is also a big attraction for predators, including wild dog packs, lone cheetah and lion prides. If you are lucky pangolin and caracal are spotted occasionally. The birdlife is certainly an attraction for many people visiting the Busanga Plains and Kafue boasts 491 species. The Busanga plays host to elegant Wattled Cranes and Fülleborn’s Longclaw. Birding habitats are diverse and include vast floodplains, broadleaved woodland (mopane and miombo), open water and riverine fringe. Other key species include Ross’s Turaco, Schalow’s Turaco, African Finfoot, Half-collared Kingfisher, Red-throated Twinspot, Böhm’s Bee-eater, Black-backed Barbet, Brown Firefinch, Sooty Chat and Western Banded Snake-Eagle. The area is alive with rollers, bee-eaters, kingfishers, herons and large flocks of Open-billed and Yellow-billed Storks.